I noticed that information about all of Omar's films is pretty scattered, so I figured I'd make a topic compiling all of the information we have on them. Feel free to add anything. "The story follows two people over the course of one day and how they deal differently with similar situations." "The Sentimental Engine Slayer tells the compelling, confounding tale of the overdue coming of age of a twenty-something misfit named Barlam. Barlam's awkward transition from boy to man is as much the story of struggling to find one's essence in a world of stereotypes as it is an indictment of the distorted reality of family life in the disengaged 21st century. A bottom-rung grocery bagger whose neo-incestuous relationship with his addict sister, Natalia, causes him no small amount of grief and disillusionment, Barlam seeks solace in the convoluted wisdom of what few male peers are available, namely his androgynous, alcoholic boss, Oscar, and the sister's simple-minded boyfriend, Zack. Seeking an explanation as to the strange circumstances of his apparent lack of family structure, as well as the respect from others fundamentally absent in his mundane model-building existence, Barlam is soon led astray amid a seedy underworld of prostitutes, hustlers and addicts. The labyrinthine plot soon begs questioning as to where reality ends and fantasy begins, Barlam shifting effortlessly between hapless punching bag, assertive surrogate father figure, and rage-prone psychopath." "Two best friends, Raul (Nomar Rizo) and Amy (Tatiana Velazquez) living in war torn Juarez, Mexico, embark on a journey to re-connect a heartbroken Raul with his lost love Gaby. During the journey, which leads them to Germany, their friendship is put to the test as they battle with cultural differences, disillusion, trust, and being an ocean away from the only home they ever knew." "We filmed this film on and off over 2 years, with the dedicated crew of "Los Arquitectos de la Histeria". An exercise in improvisational filmmaking, a film truly crafted in the editorial stage. Never working off of a conventional "script", (and building off of our experience on our last film in constructing a non-linear story) Omar and myself took much liberty in the editing room with re-arranging our scenes and inventing a story out of the hour upon hours of footage we took during our shoots in Juarez and Hamburg. With ADR as our best friend, the film's story began to emerge and we shot some new scenes some time later. The film took on a very poetic quality, getting lost in the beautiful environment photography of Juarez Mx, and the stark urban landscapes of Hamburg, while balancing perfectly with our protagonist friends as they debate the philosophy of love, loss, and friendship. Photographed on small digital cameras we were able to film everywhere and anywhere we wanted without much hassle from the authorities. Independent cinema in the truest sense of the word "independent." The film is currently going through the sound design and ADR stage. We look forward to a premiere in early 2012." "Boiling Death Request is more of a music film. There was film taken from my tours in Europe, but mixed in with some documentation of my compound where I live, the centre of energy. It's where I film, it's where I rehearse, it's also where I do everything. [Boiling Death Request] also has a narrative inside it, which I call “the failed film.” It also has abstract pieces of [pure] imagery, so I don't know how to define this film, but its centre force is music." "Set amid the noisy outskirts of some unnamed Mexican metropolis, Los Chidos tells the story of the Gonzales Family. Shady proprietors of a tire repair junkyard sandwiched between two busy freeways, the Gonzales clan's days are spent wallowing in lazy, mindless routine. Barely able to converse without resorting to misogyny and homophobia, the six of them pass the time glued to a decrepit television and stuffing their faces with tacos, preying on the occasional unlucky motorist. When a confused American industrialist happens into the shop with a flat tire, the family's place in the shame-free food chain is called into question. With his vehicle "out" for repairs indefinitely, a strange scenario unfolds whereby the pale stranger finds himself welcomed into their unpleasant fold. To complicate matters, he soon becomes infatuated with the newlywed bride of the family's neighbor. As a new love blossoms, dark secrets begin emerging, and both the family and their guest are in for some surprises. 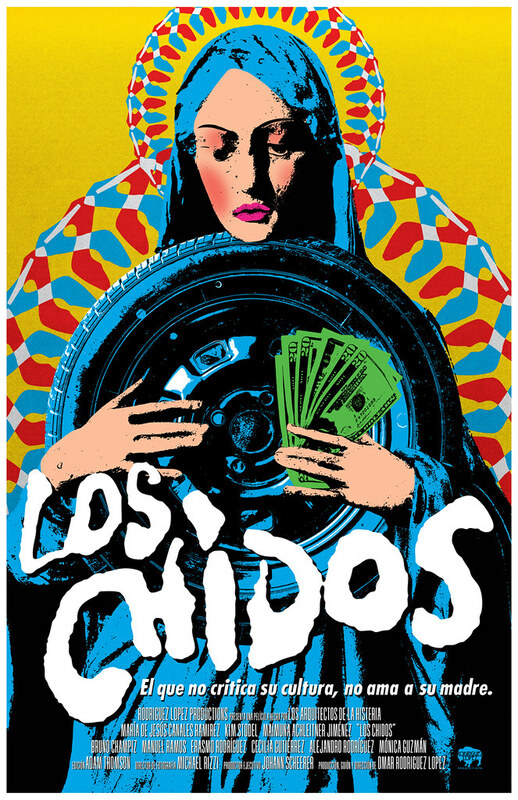 Los Chidos is at once both delightfully funny and desperately depraved; a satirical, sociopolitical commentary on the dynamic relationships between exploiter and exploited." The original plot synopsis included with the casting call was: "Niño y la Esperanza is the story of a family torn between following their dreams and the strange circumstances that befall them. Niño y Esperanza must learn how to take care of each other after their parents are infected with a manmade disease." According to this interview, however, this is not the real plot. "It is a typical barrio film, and we decided to turn it upside down." Wait... Absence really is AMDS2? Good work. Keep it updated, yo. spelling - "It is a love story between two best friends who go on a journey for one of them to have piece of mind." not a chunk of your brain. not sure if it's your wording or the original quote. how's it going under that rock where you live? i bet things are really heavy. Shut up, man. Sorry for not being fanboyish enough to spend hours digging up whatever speculations people on here are considering 'truth'. No problem! Glad you guys found it useful. Yeah that was the article I posted in the first post. El Divino also stars Nomar Rizo and Tatiana Velazquez. I still do not believe this. Jeremy does not play on Absence, and Frusciante does not sing, which I remember reading at one point about AMD2. Who says Jeremy doesn't play on Absence? It has no liner notes.